I am so honored to have my friend Jodie back again in this guest post! Read on to see how she’s coping with a back injury while caring for her two-year-old daughter. This is a great opportunity to read those books that are just a little too long for bedtime. Take this time to experiment with reading in different voices or making up chants to go along with the words. Point out different aspects of the pictures, and ask your toddlers questions as you go. On the bed or floor, make meals or snacks more fun! 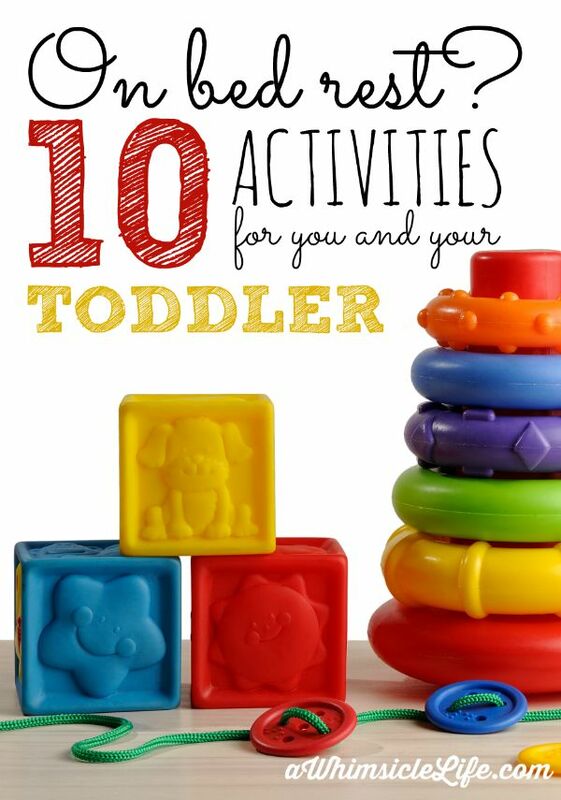 It’s a great way to sneak in some extra together time. If you’re worried about crumbs or messy food, just lay out a big towel or tray. Some quick and easy ideas for snacks that won’t leave you sleeping in crumbs are fruit—especially durable ones like apples and grapes—peanut butter, hummus, cubed pieces of cheese or tofu, and frozen veggies. For us, this involves nothing more than ducking in and out of the sheets, using our “whisper” voices to tell secrets when we duck below, and our loud voices when we come back out. Add a flashlight and books for extra fun! You can also use a tower of large Lego blocks (see item 8!) or a hanger to support the middle of the fort. Both of these involve chanting lines while tracing patterns on your toddler’s back. There are many versions online (I do my own modified version that involves ice cream and cake). It gives her the goose bumps, and she loves it! We can sit for a long time doing this. Not only is it an activity we can share, but it also helps her relax. 5. How can we use our fingers and toes? Toddlers are still at the stage where they are discovering the parts of their body and how they work. As she falls asleep, I have watched my daughter “practicing” putting up one, two, then three fingers over and over again. Quiz your toddler on the parts of her body (the elbow is a current favorite). Depending on your family, make sure to ask in different languages. We use Spanish and a little bit of Yiddish to keep it interesting. We also do silly things like a routine where I press my nose and throat gently and pull my ears, all of which make my tongue stick out and move in different directions. She loves to try and replicate this. We also do chants with accompanying hand movements (e.g. Hip Hip Hip Hippity and Bunny Bunny Bunny Whoop!). I would recommend trying some searches online for videos and ideas, or simply make up your own! So simple, yet nothing gets my toddler so excited as playing with a ball. Sometimes I sit on the floor and we roll or throw it back and forth, or—no joking—I throw it past her and we play fetch. A ball that lights up is especially great to keep her attention, and soft, lightweight ones are great to play with in the bed. Balloons work too. For us, this is the Frozen soundtrack. And Uptown Funk. I can’t dance with her right now, but I can clap and move my upper body, and I encourage her to get up and dance and sing. Anything with repetitive movements like Wheels on the Bus, Itsy Bitsy Spider, or Patty Cake is great too. When in doubt, make up your own movements! Some things like puzzle pieces can easily get lost in the bed (unless you use the really big kind). However big Lego blocks have worked for us either on the bed (consider using a breakfast tray as a base) or off to the side on the floor. Dolls, stuffed animals, and puppets are great, any of which you can use for an impromptu puppet show. This is also a great time for those keyboards or other big musical instruments to make an appearance. This is probably the most obvious and easiest activity to engage in, but there’s no reason not to enjoy it. We cuddle and have our drinks and snacks nearby. Try out new shows or movies to see what can hold your toddler’s interest. I have put on National Geographic documentaries to show her animals, and PBS has some great programming for kids. I even tried Brain Games, and we got a good 15 minutes from that! Try not to assume that your toddler will dislike something just because it’s not geared toward kids. Like most toddlers, mine loves to color. And like most toddlers, she colors on everything. I really don’t trust her with crayons on our sheets. Therefore, water markers and coloring books like Melissa and Doug’s Color Blast or Water Wow are great. We have both, and the former has pages that dry and can be colored on over and over. As an aside, the Color Blast is the only thing that keeps her in her high chair at restaurants. Also—and don’t laugh—but individually wrapped menstrual pads. My baby loves to open up new things. They are soft, make noise, and are sticky without the messiness of glue or little stickers. Tampons work too. Ordinary objects make the best toys, right? Great list! I wish I’d thought if some of these after my c section as I felt so guilty not being able to do much with my toddler. Love the last bit too-my little girl went through a phase of using menstrual pads as beds for her little plastic toy people!! Hilarious! Yes, I have had that feeling of guilt too unfortunately. She’ll love that idea of using those as beds. Thanks!